Pennsylvania is named after the father of founder William Penn, a Quaker who sought haven from religious persecution in Europe. Today, Lancaster County in southeastern Pennsylvania serves as a haven for the intensely devout Amish, Mennonites, and Brethren, collectively known as the Pennsylvania Dutch. These groups practice an agrarian lifestyle and shun the conveniences of modern society. However, for the most part they welcome respectful outsiders, and Lancaster County is well known for its Pennslyvania Dutch restaurants, its pretzel and chocolate factories, and the shops and markets where handmade crafts and quilts of exquisite quality can be found. Southeastern Pennsylvania has many other attractions, the historic city of Philadelphia for one. Just northeast of Philadelphia, on the border with New Jersey, you'll find Bucks County, an ecotourist's bonanza. Just west of Philadelphia is Valley Forge National Historical Park, where George Washingon's army trained to become a viable fighting force during the miserable winter of 1777-78. A few miles from Valley Forge is the King of Prussia Mall, the second largest shopping center in the US. In northeastern Pennsylvania, the Pocono Mountains, part of the Appalachian range, serve as a popular getway for New York City and Philadephia residents. The Appalachian Plateau continues diagonally through the center of Pennsylvania; adventurous hikers may follow the Appalachian Trail, which skirts the southern edge of the Poconos. In the south center of the state, one of the most famous battlegrounds in the history of the US is preserved as Gettysburg National Military Park, site of the ill-fated Pickett's Charge and Lincoln's stirring Gettysburg Address. 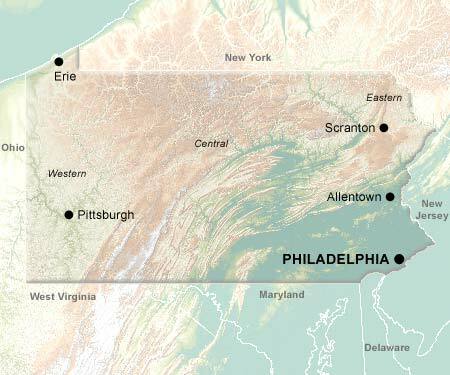 On the western end of Pennsylvania, at the confluence of three major rivers, lies the industrial city of Pittsburgh, the largest inland port in the US, and the second most populous urban area in Pennsylvania, behind Philadelphia. In Pennsylvania's northeast corner, a small stub of land borders [le]. This narrow, sandy strip was once part of the lake bed, making it geographically distinct from the rest of the state. The density of ponds and lakes in this region is even higher than in the rest of Pennsylvania.